Let’s take a look at the month ahead, November, and see what the planetary influences are and how we can work with them. We’ll start with the most long-range and overarching influences, the planets Pluto, Neptune, and Uranus, which you will notice do not change from month to month but stay in the same sector of the sky for many years. Then we will look at the mid-range influences, Jupiter and Saturn, which stay in the same sign for 1 – 2.5 years. Last we’ll look at the personal planets, Mars, Venus, Mercury, and the Sun which stay in each sign for much shorter periods and primarily influence our day-to-day lives. We don’t include the Moon in the monthly forecast because it changes signs every 2.5 days, travelling the breadth of the zodiac each and every month. We’ve spoken at length about Pluto in Capricorn (see category at right), where it will remain until 2024. In a nutshell, this long transit will bring fundamental change to many of the structures we have come to rely upon: government, banks, industries, transport systems. It carries the energy of revolution and evolution and can be dramatic and at times overwhelming. Pluto in Capricorn exposes what is hidden, for better or for worse, and usually now, at the beginning of the cycle, we become more aware of the worse rather than the better. Pluto hastens and intensifies the processes of endings and new beginnings, so it will bring about the ending of our business pursuits that are no longer suited to our growth and personal evolution. Whatever has been slowly leaking vitality will go ahead and die, including old business models, practices, and products. These are formidable energies, and your best strategy is to tune in and work with it. Resistance is futile! With Neptune in Aquarius (see category at right) from 1998 to 2011, we’ve been experiencing a forceful, heartfelt global consensus regarding the equality of the common man, shared responsibility to the group, ascendancy of people and nations based on the power of knowledge, the right of all nations to progress technologically, and the right of each person to contribute to and further the base of common knowledge. The best way to work with this energy is to allow the realm of the rational mind to open to waves of inspiration from the collective whole, from your community to the global community. Expect to be inspired by your neighbors and friends. The Uranus in Pisces (see category at right) transit from 2003 – 2010 is bringing innovation and invention to the toppling of hierarchies. It is loosening all types of boundaries and enhancing global transactions and interactions. We are all experiencing many variables in play simultaneously, and working with moving parts which connect and disconnect frequently, including projects, alliances, and workforces. How do we work with Uranus in Pisces? Product diversification, committee leadership, and collaboration, as well as global connection, and dissolution of hierarchical structures – any one of these is a good place to start. Saturn has entered the sign of Libra, where it is exalted. When a planet is exalted in a sign, it has a special affinity to the sign and if you’re willing to do the work, there is a promised payoff. I’ll write a longer post on this important planet in the coming days. But in a nutshell: what is the work of Saturn in Libra? To develop patience, persistence, responsibility, and humility in relationships. What is the payoff? Cooperation and mutual support. 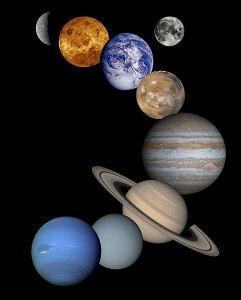 Jupiter is in Aquarius from January 2009 until January 2010. This transit brings benefits through large projects and social reform. We see the propagation of revolutionary ideas, such as liberty, democracy, anarchy, and socialism that can topple traditional institutions. Learning and advancement comes through deliberation about the nature of one’s responsibility and contribution to the group. When Mars is in Leo our assertion of will power becomes focused and controlled. Mars in Leo (see category at right) loves to lead and gives faithfully and generously to those who follow. When Mars is in Leo our tendency is to be honest, direct, and fully dependable. The sign Leo is also creative and artistic, so at this time we may love performance and display. The best use of these next eight months? Make your light shine with dignity and strength. Lead with steadiness and authority. Throw yourself into creative activities. Secure and enjoy the limelight. Venus is in Libra until November 7 and then spends the rest of the month in Scorpio. When Venus is in Libra, we experience a time when our social instincts are fair-minded and our business relationships intellectual and rational. This is a good time for hashing out contracts with everyone’s best interests in mind. Venus in Scorpio is a very different energy. Scorpio is secretive and emotional, passionate and aggressive. The people around you (and you, too) may feel self-protective and insecure. Long-lasting contractual or financial agreements can be gained at this time but may contain an element of intrigue and the possibility of betrayal. Review everything carefully and if there are unspoken emotional undertones, make sure you get them out on the table before you commit. On October 29, Mercury entered Scorpio where it will stay until it enters Sagittarius on November 15. Mercury in Scorpio brings a “fierce acuteness of mind”, according to famed astrologer Isabel Hickey. At this time we are farsighted, clear-sighted, and great at research and detective work. When Mercury enters Sagittarius, we may find our minds becoming more scattered, especially compared to the previous focus of Mercury in Scorpio. It’s a time we may miss the details of the present because our minds are captivated by the future. Try to count to three before making any snap judgments. On the plus side, communications will tend to be sincere and honest. With the Sun in Scorpio, we can exhibit great creativity and resourcefulness, and our strength comes from service, compassion, and humility. This is a good time to be clear about your financial strengths and weaknesses and to make a plan to address any shortfalls. The Sun moves into Sagittarius on November 21. This is a friendly, outgoing, optimistic time, the beginning of the holiday season. In fact, we may tend toward over-exuberance as we know we are sliding into the Winter Solstice in the northern hemisphere. Increased sales are favored under Sagittarius and a generosity of spirit with employees and coworkers is a great use of this energy. Against the backdrop of massive global changes to the structures in our lives, we are inspired by and engaged with the global community as never before. With Jupiter and Saturn both in air signs, we find our footing in the realm of social ideas, such as responsibility to each other and to the wider public. We want to toot our own horn but may feel held back this month by feelings of self-protection and insecurity in our relationships with others. Our minds move from clarity of focus to “spread too thin”, as we begin the holiday season and approach the Solstice. Let me know how your month plays out! This entry was posted on Monday, November 2nd, 2009 and is filed under Astro4Business Month Ahead. You can follow any responses to this entry through RSS 2.0. You can leave a response, or trackback from your own site.